Your pool table room or game room is an excellent place to hold parties and relax with friends and family. Take a peek at our tips and tricks on how to make the best game room with pool table room décor. You never know, you might feel inspired to change your current pool table room's look! Having your own game room with only a pool table in it will feel like the entire room lacks something. When you have people in your game room, you'd want to make a good impression; however, just having pool sticks, balls, and a table won't cut it. You need game room accessories that are capable of complementing the space. It is important for your game room to have all the necessary gear so people get attracted to lounge, play, and have fun in your space. Below, you'll find a handy guide on how to pull off the best game room. Check it out. The first thing you need is the right lighting in your pool table room. You can opt for background lighting or a table light that's installed right above your pool table. What we suggest is getting both as they complement each other, as well as the rest of your room's décor. When selecting between different units with different styles, pick the best one that will illuminate the room and look stylish at the same time. If you plan to have a game room with minimal design, the best table light for you is one that stands out and serves as a statement piece. To spice up your game room, include vintage posters, neon signage, mirrors, and clocks. If you are looking for a game room clock, get the one that goes with your room's theme. You can find billiard clocks at myriads of online stores. Look at your choices and pick the one that blends in with your room décor. As for prints and posters, the best used in game rooms are from the 1900s era that feature old-fashioned sodas. But, anything that looks sporty and vintage would look great in the space. What's fun about game room décor is that you can change it up easily. When you are ready for new décor, you can simply take the old ones out and replace them with the new. The key to decorating a pool table room is to not overdo it. A few wall pieces and great lighting will already do the trick. Setting up a game room can be fun! Take a look at our top picks on pool table room décor as they are guaranteed to attract more people that you won't have any shortage of visitors! Game rooms offer great opportunities to incorporate layers of colors. However, you should resist the temptation to go overboard and crazy over several different saturated tones. What's the best way for you to enhance a drab-looking wall? It's by adding this hand-carved 3D Pool Table Wall Decor by RAM Game Room! It's all you need to tie everything within your room together. An alternative to the first wall piece we featured is this simple and straightforward billiards room wall decor from Williston Forge. It's the first thing that you'd want to add into your masculine man cave if you're after simplicity with your room's design. It's sleek, simple, yet sophisticated, perfect for a game room where function, instead of style, reigns supreme. Another way to amp up your space's masculinity is by incorporating this wall decor that has an industrial-feeling to it. It's best hung on a dark, moody wall as it lends gravity to the space and makes it feel more relaxing and cozy. This wooden sign is guaranteed to last for years with its vibrant colors still intact. The best thing about it? It's customizable! If you are fed up of being greeted by blank walls and boring lights every single time you enter your game room, then outfit your wall with this LED Marquee Sign from Crystal Art Gallery. It has substance, style, and, yes, even utilitarian value! It comes with five LED lights that will give your game room the vivid element that it needs! This billiards-themed signage and coat rack combo can help transform a plain-looking game room into a masculine paradise. It's best for those who have an eye for nuances, and it is guaranteed to impress your family, friends, and guests! It can even reaffirm your self-value. It's 3D, hand-painted, and hand-carved. What more can you ask from a functional wall accessory? There are no definite rules when decorating game rooms, but you'd definitely get the most bang for your buck with multifunctional pieces like this 3-light billiard light from Red Barrel Studio as it's both stylish and functional. With its contemporary look, it's best for modern, laid back, and family-friendly game rooms. This billiards-themed wall clock adds pattern and texture to walls. It's the ultimate design solution if you are looking into adding some character to your space. Its elegant but masculine vibe makes for an incredible accent to walls, regardless of the color. This Bush Pool Table Light from Loon Peak made of metal and glass is simply a work of art. Imagine yourself looking up and seeing this hung from your ceiling; you'll definitely feel luxurious and special even when you're just in your game room. it makes use of 3 100W bulbs and it comes with a traditional bronze finish. This set of antiqued billiard balls from Birch Lane is a highly desirable game room addition as it adds interest to a room. Regardless of whether you're a rookie or pro at playing pool, you'll love how the balls bring about a vintage charm to a space. What's more, it's incredibly easy to clean! 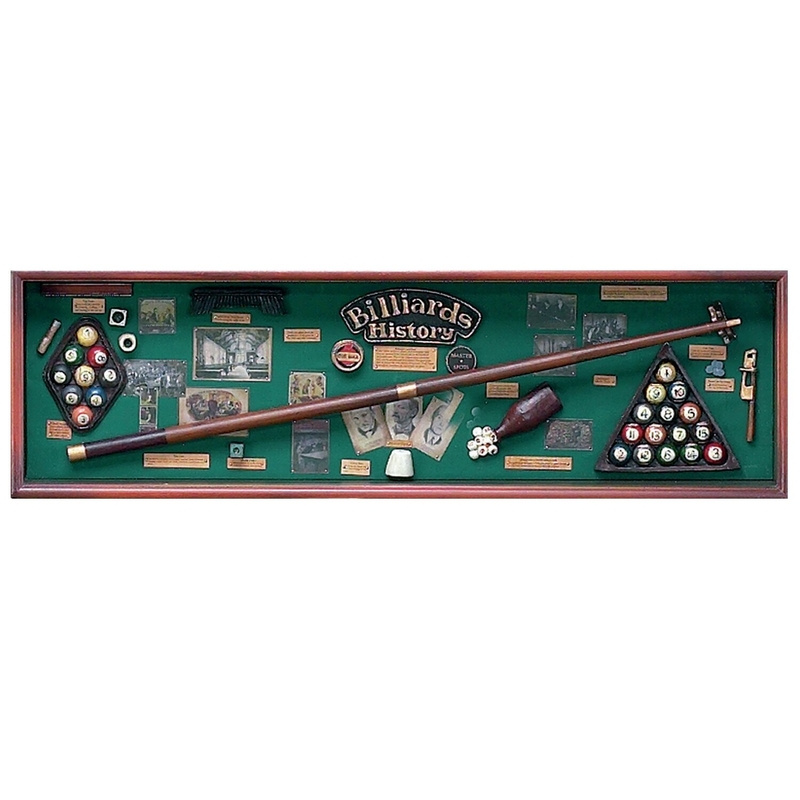 Your competitiveness and fun side can be introduced cleverly with this Billiard Parlour Scoreboard from RAM Game Room. It will record your scores in the most hassle-free way as all you have to do is slide the marker instead of tally scores. It also has a classic pub aesthetic, which means it's best added to vintage-themed game rooms.